Andy Warhol's fascination with portraiture spanned his entire career. He experimented with the portrait as an embodiment of death in well known images of Marylin Monroe, Elizabeth Taylor, Jackie Kennedy, and Elvis, all of which served as a segue into his uniquely morose Death and Disaster series. Warhol also made hundreds upon hundreds of photographic portraits on film in the form of screen tests, positioning his subjects in front of a camera and allowing them to be themselves. For Warhol, everyone was interesting. He imbued each of his subjects, famous or not, with an iconic and alluring quality so that the viewer would share in his exultation of each person framed caught within the frame. Around 1975, the artist began to make portraits of black and Hispanic drag queens, collectively known as his Ladies and Gentlemen series. Warhol saw drag queens as "ambulatory archives of ideal movie star womanhood" who performed a "documentary service, usually consecrating their lives to keeping the glittering alternative alive and available for not-too-close inspection" (A. Warhol, quoted in eds. Phaidon Press, Andy Warhol: Giant Size, Phaidon, New York, 2006, p. 508). The double-entendre title amplifies the gender play at work in the series, while glamour, perhaps less obvious in other portraits, acts as an agent of disguise. In the present lot, Warhol applied expressionist paint strokes over and under his silk-screened image. These broad strokes of color loosely outline the forms, adding an individualized element to Warhol's world of mechanical artistic production. 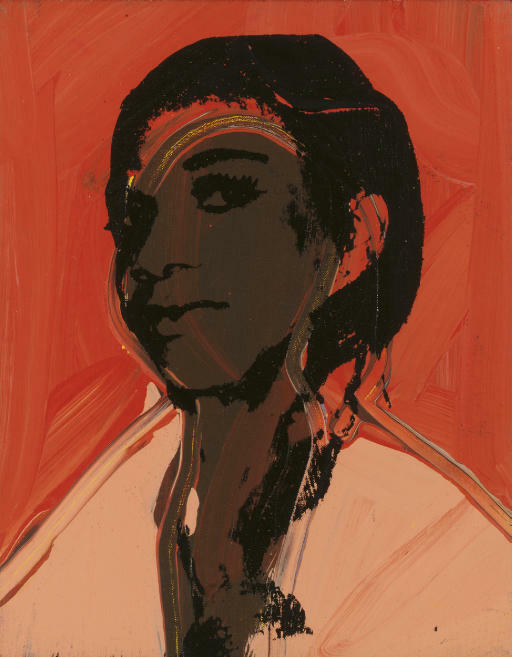 Particularly evident in the Ladies and Gentlemen portraits is Warhol's interest in issues of race in America, initially explored in the Race Riot images of 1963, Warhol expands on this theme creating in Ladies and Gentlemen a pop-history, documentary style painting with a cool and detachment approach. Ladies and Gentlemen is a unique synthesis of several key concepts explored within the artist's oeuvre.